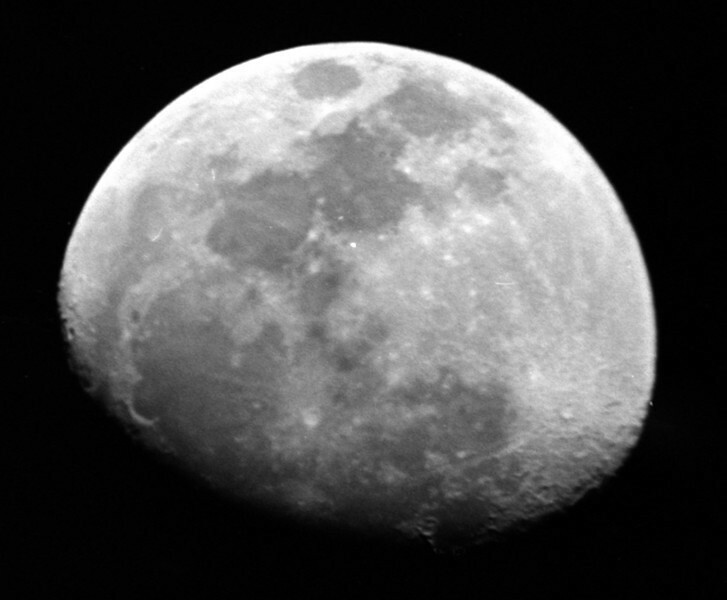 This is my first astronomical photograph using my first astronomical telescope. It was quite a thrill at the time to be able to take a photograph and then be able to show others what it was that I was looking at in the night sky, despite the poor focus and/or shutter and equipment shake. 4 1/2" f/10 Newtonian Reflector on a German equatorial mount (no motor drives) . Zenit-E 35mm SLR camera at Prime Focus F=1140mm. Exposure 1/30 sec @ f/10, Kodak Plus X ASA125 film. Scanned using Canon MP980 MFP 15/10/2011. Post processed by Adobe Photoshop CS5 to crop and sharpen.